​iNi KAMOZE - ​"The Pulse of the People"
re-recorded by iNi Kamoze and 9 SoundClik. New and reworked tracks show iNi's versatility as an artist of the highest caliber. NOW AVAILABLE ON CD exclusively on this website! Full color CD art and 16 page booklet with lyrics and credits! You can follow iNi Kamoze on social media using the yellow icons above on the right of this page! There is only one true Facebook account so be wary of imposters! BBC1Xtra's David Rodigan declares iNi Kamoze meets Xterminator: Tramplin' Down Babylon to be "Absolutely brilliant!" "One of the best albums so far... - July 2016"
​The new CD featuring the booklet with lyrics, liner notes, and credits! Love iNi Kamoze lyrics? Follow along on the newly launched iNi Kamoze YouTube channel which will feature the Official lyric videos! David Rodigan premiered the song Trample as the "Scorcher" of the week on his BBC Radio 1Xtra radio show! He later dropped Goodness And Mercy with high praise for iNi Kamoze meets Xterminator: Tramplin' Down Babylon! iNi Kamoze meets Xterminator: Tramplin' Down Babylon is NOW AVAILABLE on all music platforms! 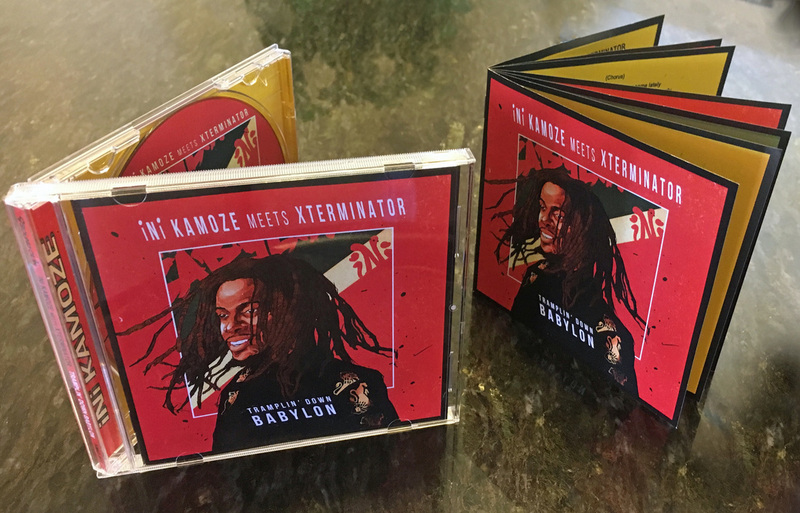 One of Jamaica's most sought after young graphic artists Taj Francis teams with 9 Soundclik to create the artwork for iNi Kamoze's new album releases. "Here Comes The Hotstepper" is featured in Hollywood's blockbuster film Everest. "Welcome to Jamrock", written by iNi Kamoze, Damian "Jr. Gong" Marley and Stephen Marley is featured in the film The Perfect Guy. "Here Comes The Hotstepper" is prominently heard in the comedy film Neighbors . The hugely popular Evian water ads use a version of "Here Comes The Hotstepper" for it's Baby And Me commercials. Jamaica's brilliant producer Phillip "Winta" James reworks iNi Kamoze's "Wings With Me" riddim as the Rootsman riddim, propelling the careers of Chronixx and other contemporary reggae artists. Protoje's "Kington Be Wise" music video is released, the song taken from iNi's "England Be Nice". A 15 foot high and wide mural of iNi was created for the shoot. "Call the Police" is featured in the film 21 Jump Street. It was also used in the 1995 film Bad Boys. Featuring Remixes of the chart topping hit HERE COMES THE HOTSTEPPER as well as Clown Talking and Listen Me Tic. Available on Amazon, iTunes, and Google Play.